The United States Congress designated the San Juan Wilderness (map) in 1976 and it now has a total of 353 acres. All of this wilderness is located in Washington and is managed by the Fish and Wildlife Service. The tips of submerged mountains collectively thrust above the sea where two straits--Georgia and Juan de Fuca--meet up with Puget Sound, forming the San Juan Islands. 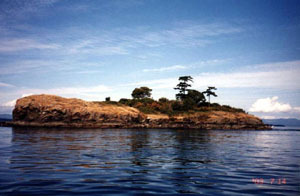 Of the 700 or so islands, islets, rocks, and reefs that make up the San Juan Islands, fewer than 200 have garnered official names. The large islands of San Juan, Lopez, Orcas, and Shaw make up more than 80 percent of the landmass. Of the rest of the land, much of it wave-drenched, 83 pieces are included in the San Juan Islands National Wildlife Refuge, a sanctuary for gulls, cormorants, guillemots, puffins, brants, oystercatchers, auklets, bald eagles, and harbor seals. Of these 83 specks of land above the line of mean high water, 80 have been designated Wilderness: Aleck Rocks, Bare Island, Barren Island, Battleship Island, Bird Rock, Black Rock, Boulder Island, Brown Rock, Buck Island, Castle Island, Center Reef, Clements Reef, Colville Island, Crab Island, Davidson Rock, Eliza Rock, Flattop Island, Flower Island, Fortress Island, Four Bird Rocks, Gull Reef, Gull Rock, Half Tide Rock, Hall Island, Harbor Rock, Lawson Rock, Little Sister Island, two named Low Island, Matia Island (with the exception of the five acres camping area managed under an Memorandum of Understanding with Washington State Parks), Mouatt Reef, Mummy Rocks, Nob Island, North Pacific Rock, North Peapod Rocks, Parker Reef, Peapod Rocks, Pointer Island, Puffin Island, Rim and Rum Islands, Ripple Island, Secar Rock, Sentinel Island, Shag Rock, Shark Reef, Skipjack Island, Skull Island, Small Island, South Peapod Rocks, Swirl Island, The Sisters, Three Williamson Rocks, Tift Rocks, Turn Rock, Viti Rocks, White Rocks, and Willow Island, along with various unnamed islands, islets, rocks, and reefs. Planning to Visit the San Juan Wilderness? How to follow the seven standard Leave No Trace principles differs in different parts of the country (desert vs. Rocky Mountains). Click on any of the principles listed below to learn more about how they apply in the San Juan Wilderness.